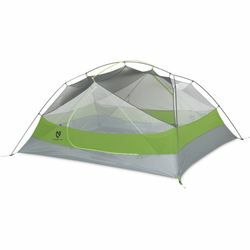 NEMO Dagger 3P Ultralight Backpacking Tent. Dagger™ is the quintessential one-tent wonder: light enough for backpacking, yet roomy enough to comfortably wait out a rainstorm inside. This best-seller is updated in 2019 with prebent poles to create more headroom, color-coded poles and webbing for intuitive set up, and several additional improvements to increase ventilation, convenience, and durability. With two doors and two massive trapezoidal vestibules, Dagger™ has more area and volume for storage than any other tent in its price and weight category. It also has the unique Divvy™ dual-stage stuff sack, which allows you to split the load with a partner. Two large doors and massive trapezoidal vestibules offer ease of entry and more volume for storage than any other tent in its category. Key updates include pre-bent DAC Featherlite poles with Jake’s feet and lengthened main pole for significant increase in volume at the head and foot ends. Color-coded anodized poles and matched webbing for an intuitive set up. Integrated 15D Nylon and No-See-Um Mesh sidewalls provide ample air flow and temperature control. White No-See-Um Mesh on side panels adds privacy, while a black mesh top offers clear stargazing at night. Overhead Light Pockets™ at both ends use special light-diffusing fabric to cast an even glow throughout the tent. Divvy™ Sack dual-stage stuff sack allows you to split the load with a hiking partner. Gear Pockets™ at each corner offer both partners ample storage for personal items. Protected strut vents at the top of each zipper flap ensure greater ventilation, especially during a storm.